Sea Illumination: A LOOK AT SPECIES CONSERVATION : Are Some Species More Important to Conserve Than Others? A LOOK AT SPECIES CONSERVATION : Are Some Species More Important to Conserve Than Others? I'd like to introduce a common idea and conversation had in the conservation world. Are some species more important to conserve than others? The answer to this question is yes, and no. Most conservation biologists will tell you that all life, diverse and abundant, is important and if we could save 'it all' we would. That's our calling in life. But the reality is much more complicated. What is it about a particular species that makes us want to conserve it? Generally, it has been the large, cute and cuddly, charismatic ones that grabbed our attention, (we call those ones 'Charismatic Mega-fauna'). But as ‘the bigger picture’ comes into focus, biologists are now recognizing the vital importance biodiversity plays in the health of our planet and human livelihoods (Vie, J., et. al.). In the midst of a mass extinction and on the edge of a major climate change, the evolutionary pressure we humans are putting on nature is unquestionably the most extensive experienced by our home from any one individual species, ever. The debate of choosing which species to conserve over another is ongoing and problematic, often with decisions becoming bogged down by political will, public opinion, and financial resource availability. An example of this can be seen in the gross unequal distribution of funding given to the iconic Bald Eagle (Haliaeetus leucocephalus) in the United States, protected under the Endangered Species Act (ESA), ‘received more recovery funds than did the accumulated total of the 894 species (67%) with the least funding’ in 2004 (Schwartz, 2008). Clearly the emblematic value of the Bald Eagle won out over its utilitarian value. This is usually how species conservation is accomplished in the modern day world. The Bald Eagle is now listed as a species of least concern (LC) by the International Union for Conservation of Nature (IUCN) and has been delisted from the ESA since 2007. The criterion for which species are placed in the care of a conservation program is varied. The IUCN ‘currently include(s) nine categories and five quantitative criteria’ which are based on population trend, size, and structure as well as geographic range (Vie et al, 2009). The World Wildlife Fund (WWF) is currently focusing on 36 so called ‘priority species groups’ which fall into two categories: ‘Flagship species' - iconic animals that provide a focus for raising awareness and stimulating action and funding for broader conservation efforts and 'Footprint-impacted species' - species whose populations are primarily threatened because of unsustainable hunting, logging or fishing’ (Duncan, 2008). Under the Endangered Species Act, in the United States, conservation is divided between Fish and Wildlife Service for terrestrial and freshwater species and National Oceanic and Atmospheric Administration’s (NOAA) National Marine Fisheries Service (NMFS) for everything marine. Under the ESA a species, defined as species, subspecies, distinct population segment (DPS), or Evolutionarily Significant Unit (ESU), are listed based on population size in, all or some of, its natural range. The trend here is to conserve that which carries an intrinsic value to us, often this involves a backbone in the literal sense. The species that garner much of the attention and funding, and are almost always used as the ‘poster board child’ for conservation, are the charismatic ones, so named for how they appeal to our desires for symbols of the natural world, e.g. : what is majestic or cute. Charismatic species don’t require the public at large to have an academic background to understand the need to protect them. Their value can be seen in what they symbolized to us. But are we really involved with conservation if all we are interested in is vertebrates? These programs, and the myriad of those like them, use a top-down approach that has focused mainly on plants and animals. These only comprise two out of the five Kingdoms (Monera, Protista, Fungi, Plantae, and Animalia), leaving the majority of life on earth out of the programs. Though the majority of species under protection of conservation programs are plants and animals, the basis for all life on the planet lies in the kingdom Monera. Much of what we know about this group has come with the advent of the microscope and most recently with the technological advances in biological genetics. In 1990, Carl Woese divided the Monera kingdom using molecular comparisons, stating in a published paper ‘that life on this planet divides into three primary groupings, commonly known as the eubacteria, the archaebacteria, and the eukaryotes’ (Woese, 1990). As early as 1934 microbes were recognized as being pervasive, as stated by Baas-Becking ‘Everything is everywhere, the environment selects’ (Baas-Becking, 1934), the idea being that where an ‘environment is created in different locations, the same microbial community will develop with the same microbial species’ (Taylor, 2006). The importance of microbial species is vital and, though they are miniscule and abundant, without them all life on the planet dies, including us. One supporter for the conservation of the little guy is Professor Lynne Boddy of the Cardiff School of Biosciences who advocates for fungi conservation. Boddy explains fungi ‘are hugely important as food for soil, animals and in producing human food, e.g. Quorn, cheese, chocolate and soft drinks. Fungi produce many "wonder drugs" including penicillin and statins to control cholesterol’ (Aldred, 2008). The loss of fungi from earth would be devastating to most terrestrial plants who depend on fungi’s relationship with their roots to secure water and nutrients from the surrounding soil, approximately 80% (Smith, 1997). Besides removing waste and recycling nutrients in the environment, it is now thought ‘mycorrhizal fungi might sequester increased amounts of Carbon in living, dead and residual hyphal biomass in the soil’ (Allen, 2000) and thus act as a carbon sink. But if we are to choose a singular species of fungi to conserve, Boddy’s choice is the fly agaric, Amanita muscaria. 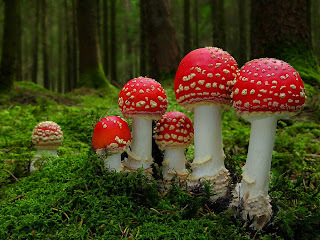 In addition to forming mycorrhizas with the roots of forest trees, thereby providing them with nutrients and water, and recycling dead organic material, this fungi is a food source for some animals and ‘produces powerful chemicals that may turn out to yield novel pharmaceuticals’ (Aldred, 2008). The value of the unseen species grows even further when you investigate the aquatic environment and discover there the impact plankton has on primary production, the production of organic compounds that forms the base of the food chain for all life on earth. This food production in the ocean supports all marine species; including many found listed in conservation programs like the whale shark (Rhincodon typus) whose main diet includes, among other things, plankton. Of particular importance is phytoplankton (phyto meaning plant) which is grossly estimated to produce fifty to ninety percent of the worlds oxygen (Livingston, 1992, Ducklow, 1993). These single-celled organisms, while performing oxygen production, pull carbon from the surrounding environment. When they die, they sink to the bottom of the ocean, carrying that carbon with them, making the ocean the largest carbon sink on the planet. This crucial action is of great interest to climate scientists who have found by fertilizing areas of the ocean with iron they can cause phytoplankton to increase carbon sequestering (Buesseler, 2004, Baines, 1991). Though it would be difficult to identify and name all species of plankton, little alone choose one for conservation, plankton is crucial to ecosystems and is often over looked. Another spineless wonder frequently ignored by conservation programs are the Arthropods, aka: insects. The most valuable of which are the pollinators. Present day agriculture could not survive without them. In Britain their economic value, with regard to agriculture, is reportedly an estimated $192 billion (Aldred, 2008) and in the U.S., pollination from bees alone is estimated at $14 billion (Lovgren, 2007). In recent years, beekeepers from around the world began seeing an alarming trend, the bees are disappearing. The steep decline in wild and managed bee populations have been attributed to five major causes: 1) land use practices, 2) agrochemicals (think Monsanto and Dupont), 3) parasites and diseases, 4) human-induced competition between species and individuals, and 5) climate change (Kuldna et al, 2008). In an attempt to conserve bee populations in Britain the world’s first bumblebee sanctuary has been created on ‘Vane Farm, part of the broader Loch Leven National Nature Reserve’ (anon, 2008). 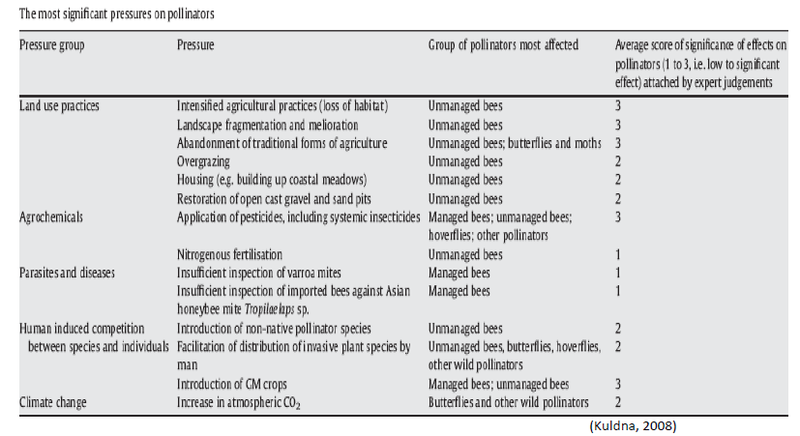 Given bee populations are still in decline, as reported earlier this year (Hadden, 2013), and the importance of this mighty pollinator, the bee shows itself to be a strong candidate for more conservation programs. The value we initially place on a particular species has often reflected what we humans find ecstatically pleasing in nature. However, as we begin to understand the importance of ecosystems, not just species, we will hopefully begin to recognize it all comes down to habitat. Seen in this light, placing an animal under the care of a conservation program then becomes less about an individual species and more about the ecosystem in which it lives. 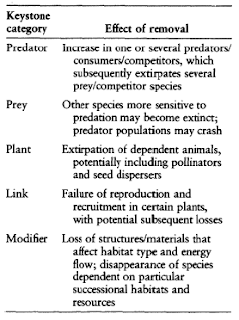 Governed by current conservation criteria, the ways in which a species is chosen can benefit the environment in a numerous ways. Thus, the choice of a species is often the reflection of the environment, rather than the species itself. Returning to the example of the Bald Eagle, which illustrates how the Endangered Species Act is more about land management than species conservation. According to R.J. Smith, director of the Center for Private Conservation says the recovery of the bird would have been accelerated if not for the constraints put on by the ESA. Smith is stated as saying “The final delisting of the now-numerous eagles was delayed as environmentalists wanted to keep the eagles on the ESA list in order to have the power to regulate land use and following delisting environmentalists in Arizona were able to get the desert population relisted, mainly in order to control activities involving water use” (Cohen, 2009). The benefit of protecting an iconic species, like the Bald Eagle, is that the habitat in which they live will also be protected, along with all the ecosystem processes that are so beneficial to our own livelihoods. It also brings up questions of possibly revamping the ESA. Wouldn't it be nice to have legislation that reflected current scientific findings and acted appropriately? The politics of conservation constantly over looks species that provide ecosystem services that are salubrious to man. This utilitarian value is given in terms of what we humans ‘get out’ of nature such as the food we eat, the clean water we drink, and the air we breathe. It can also refer to the cultural, educational, recreational and scientific uses and values. A study done in the UK at the University of Essex has shown that outdoor workouts and activity, or ‘green exercise’, improves self-esteem in ninety percent of participants in the study (Pretty, 2007. The Greening of Healthcare. New Scientist.). This research suggests that what we ‘get out’ of the natural environment is vital to our mental well being and should be considered by policy makers when talking about healthcare and its costs. The cost of biodiversity conservation is now gaining momentum in the international community. Collaborations like The Economics of Ecosystems and Biodiversity (TEEB) and Millennium Ecosystem Assessment have brought together extensive scientific and economic research establishing the cost benefits of biodiversity conservation. TEBB has found ‘poverty and the loss of ecosystems and biodiversity to be inextricably intertwined’, while the Millennium Ecosystem Assessment states ‘the costs and risks associated with biodiversity loss are expected to increase, and to fall disproportionately on the poor’. One can look no further than the example of Easter Island, set in the past or the present day situation, with the contrasting landscape shared by the Dominican Republic and Haiti to understand the value of conserving nature. Like the canary in the coal mine these cases illustrate that environmental degradation is closely tied to economics and the inequality of a society. The answer to the question ‘Are some species more important to conserve that others?’ in short is yes. The saying “to go the way of the Dodo (Raphus cucullatus)” might convey a more ominous connotation if it had carried an entire ecosystem, like the rainforest, with it into extinction. Conservation of species is no longer about the individual species, but of the whole ecosystem to which they are tied. If, by conserving a particular species, you conserve that ecosystem and all the services it provides then that program will have been a success. Some species make better representatives than others, like the Giant Panda (Ailuropoda melanoleuca) and the Bengal Tiger (Panthera tigris tigris). Until governments recognize the ‘bigger picture’, conservation programs will rely on the public’s support of the more charismatic species and the funding and political will they bring. Fly agaric, Amanita muscaria. The fungus among us. Could you love a fungus? Would you protect it like a dolphin?